Students who take their unquestioned or unsatisfying answers to college, often find their whole basis for faith called into question by the required courses in "humanities," which usually feature at least one course on religion. When students hear Christianity and the Bible taught and discussed in those classes, the subject matter sounds altogether different from what they were taught in church. In the classroom, the historical-critical method of analysis takes the place of the church's more "devotional" method. The focus in the classroom is on sources, names, events, places, and dates. The church, especially the youth group, usually focuses on what a person thinks God is saying to them through a passage of Scripture. The real differences, however, might add up to nothing more than a difference in emphasis. The emphasis in the church is that a glorious and holy God has created the world, revealed his will and way to us in the Bible, and sought to reconcile the sin-stained world to himself through Jesus Christ. 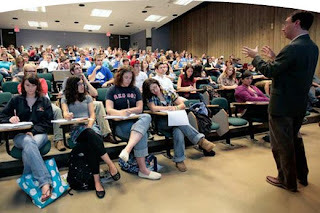 The emphasis in the classroom is that god has been a common feature in most civilizations in world history, the Bible is the collection of texts that three particular groups view as sacred (and one of those has that view for only the first part of it), and Jesus was a Jewish preacher who was execute by the Roman for insurrection. Those two different presentations aren't necessarily at odds with each other - that's why I said there might be nothing more than a difference in emphasis. There's actually nothing wrong with the classroom portrayal of God, the Bible, or Jesus that I just outlined - all of it is true. The church just claims more to be true about them than the college professor does.